Step 1 Rinse the rice well, then drain and spread it out on a platter to dry. Step 2 Place the tomatoes in a blender and blend until pureed, adding a little broth or water if needed. Pour into a 2-cup measuring cup and add enough broth or water to measure 2 cups. Set aside. Step 3Heat the oil in a medium saucepan. Add the rice and cumin seeds and fry until the rice begins to brown. Add the garlic and onion and cook, stirring often, until tender, about 3 to 4 minutes. Step 4Add the tomato liquid and 1 teaspoon salt and bring to a boil. Cover and simmer until the liquid is absorbed, placing the pot on a heat diffuser if necessary to prevent burning and sticking, about 28 minutes. Fluff with a fork and serve. In Recipes-list.com we have selected the most viewed recipes from category - Sides . Enjoy the best recipes specially selected for you! 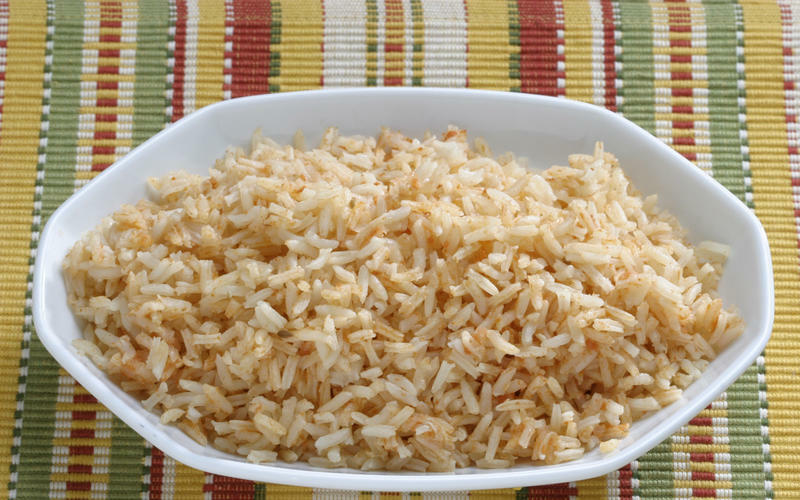 Mexican rice is the right choice that will satisfy all your claims.